Sensing personalities are the types with an “S” in their type code. For example, ESTJ or ISFP. Grades K through six are heavily Sensing oriented. Two-thirds of elementary and middle-school teachers are sensing personality types. The world of facts, practicality, and experience are what make sense of the sensors world. Sensing children love to learn by getting their hands on things, writing on the chalkboard, making crafts and learning through experience. SJ children (ISTJs, ISFJs, ESTJs, ESFJs) like repetition and practice. A steady, consistent routine helps them to feel at home and safe in the classroom. SP children (ISTPs, ISFPs, ESTPs, ESFPs) like the focus on the crafting, hands-on application, and movement that comes with early education. Sensing children enjoy an education that is practical, tactile, and has clear achievable results. They are the “doers” of the world, and they want to know exactly HOW they are going to use what they are learning in the real world someday. Theories, extrapolations and abstractions can bore them or feel irrelevant. Intuitive children, in contrast, are usually not paired with intuitive teachers in grade school. Intuitive children have an “N” in their four-letter type code: For example, INFJ or ENFP. While they can enjoy the hands-on interaction and learning that comes with their education, they also tend to feel bored because of the focus on details. Having proper cursive, memorizing facts, and repeating their sums can feel pointless and mind-numbing to them. They’d much rather focus on concepts, theories, and big-picture ideas. They’d rather have an over-arching framework for how they will learn than a set of facts to memorize and later write down on a paper. They can feel trapped in a school system that doesn’t let them argue, theorize, or make inferences. They may feel like their learning is “pointless” and get fed up with the repetition and routine of it all. Intuitives are the conceptualizers in the education system. They like less direction and more open-ended projects and assignments. They like questioning, hypothesizing, and asking “What if?” They thrive on abstract studies. Repetition, detail-work, and a lot of “doing” can get in the way of their natural learning style. In High School, things normalize a little more with about half the teachers being Sensors and half having an Intuitive preference. The tables turn in college, where about 70-80% of the teachers have a preference for intuition. Since the U.S. population is about 70% sensing, you can see how this might create a problem. Intuitives tend to teach in a hypothetical, rambling, open-ended way. They focus on theories, concepts, and meanings rather than specifics and details. An intuitive professor might begin a lecture by talking about the five reasons why the Civil War occurred, only to expand on a dissertation full of information about the underlying causes of racism and war in general. At the end of the lecture they may have given zero specifics about WHY the civil war happened. They then might assign homework that is equally vague to the sensor. “I don’t give specifics or page numbers on research papers,” admitted one intuitive teacher I spoke with, “I want them to figure it out for themselves when they have explained the subject clearly. When they’ve figured that out, they’ll know they can be done.” These kinds of intuitive teaching practices can leave sensing students confused and frustrated. They may wonder why they even showed up to class at all when they aren’t getting the specific information that satisfies their need for clarity. Sensing students want specific, direct education. They want something practical, clear, and usable in the real world. In contrast, intuitives can never master enough theory. They constantly crave more of it. This creates a conflict between intuitive professors and sensing students in college. Sensors, who in grade school excelled because of their sensing-paired teachers, can find themselves frustrated and overwhelmed with professors who speak in the hypothesizing, theorizing manner of intuitive teachers. Sensing-perceivers are not the only ones to struggle in school, however. 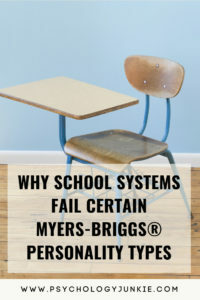 INTPs, often considered ingenious and intellectual, are one of four types who said that school was a source of high stress (Myers et al., 1998). INTPs and ENTPs are often criticized for their skepticism, constant questioning, and their tendency to take on “teacher’s adversary”. INTPs and ENTPs have little respect for rank and they have a tendency to play devil’s advocate as a way of testing theories and facts to see if they hold up to scrutiny. This lands them in hot water with teachers who see them as defiant and unwilling to buckle down and obey the rules. Remember how two-thirds of grade-school teachers are of the sensing variety? The majority of these teachers are Sensing-Judging personality types. Sensing-judging teachers tend to (unknowingly)cater to sensing-judging students in the same way that intuitives cater to intuitives. Teachers don’t realize they are doing this because most education systems aren’t using type theory in the classroom. Being scheduled, structured, detail-oriented, and by-the-book is second-nature to Sensing-Judging personality types. Intuitive perceivers, in contrast, are random, global, focused more on theories than specifics, and HATE being structured or having to focus on details. On top of this, NP personality types tend to find their minds wandering if an interesting subject presents itself. While the teacher goes onto explain a different topic, they find themselves extrapolating on the subject that glitters before their mind. They are later scolded for being distractable, unfocused, and even hyperactive. Thankfully, while Intuitive Perceivers may struggle in grade-school, they tend to excel in higher education where they are matched with professors who tend to “speak their language” academically. Explain the human impact of what they are learning. How will their studies benefit them or others? Let them write letters in defense of a cause they believe in. Focus on the big picture rather than the details. Give them a steep learning curve. Understand that they will get bored with detail-work. Let them theorize, extrapolate and make inferences. Appreciate their insights and observations about far-reaching future consequences and possibilities. Let them predict. What are the far-reaching consequences of a certain action or plan? Explain why. Be prepared for them to play devil’s advocate. Let INTPs and INTJs research independently. Let ENTPs and ENTJs lead interactive classroom projects. Let them engage in debate team. Understand that they learn through arguing. Focus on the big picture rather than all the minute details. Let them theorize, extrapolate, and make inferences. Let them practice, repeat, and practice some more. They crave mastery. Give them a routine and structure so they feel safe and focused. Teach in a linear, sequential way. Be as specific as possible. Don’t beat around the bush or get lost in theorizing. Give them bullet points at the end of each lecture to re-assess the important facts. Let STJs debate, question, argue or test your competence. Give SFJs affirmation and encouragement. Show them that you care about them. Give real-world examples so that they can visualize how they will use their studies in real life after school is over. Give ISTJs and ISFJs time for independent study. Give ESFJs and ESTJs time for collaboration with other students. Let them use their hands. Find kinesthetic ways for them to interact with the subject at hand. Show them real-world examples of how the topics impact them. Let them interview people to learn more about a subject. Let them get up and move around. Make the environment inviting and pleasant. Give ISTPs and ISFPs one-on-one instruction or time for independent study. Give ESTPs and ESFPs interactive time with other students. They enjoy collaborating. Understand that they will get fidgety and have a harder time concentrating if they are forced to sit still for a long time. Don’t theorize and extrapolate unless you have to. Be realistic and give them specific, concrete pointers. Challenge ISTPs and ESTPs. Their competitive nature will motivate them. – Speak to the values of ISFPs and ESFPs. How will their studies help them or others? Give ISFPs and ESFPs affirmation and validation. Let them know that you care about them. Have you enjoyed this article? Do you have any experiences or insights to share? Let us know in the comments! Want to find your child’s type and work with their personality better? Check out our Parenting by Personality video-course! Or it could just be that Meyers Briggs personality types are pseudoscience, and don’t belong in discussions regarding education. The scientific or empirical method cannot justify your scientism, so on what basis are you advocating it? The statement you made is pseudoscience as well by that criteria. Different methods have been developed in the various disciplines based on what is possible and optimal for the subject at hand. Empirical studies are best used in physical sciences, but is not effective in the social sciences. That doesn’t say anything bad about either one, but rather that they are not the proper way to approach the subject. Probability not proof is what is obtainable, but just because the opposite conclusion can be evaded, doesn’t mean it is the most reasonable conclusion to make. Commit yourself to getting to the truth rather than dismissing everything that cannot be studied by a certain method. If you commit yourself to finding out whats true, then you will obtain it. Truth is the ultimate goal, and that demands objective consideration of all reasons for or against it. Nothing should be dismissed by assertion but rather by which side has the most probability of being true. Refusing to believe all truths that are not scientifically proven is not scientifically proven itself. Disciplines have different methods that have been refined over the years that are the best known methods of obtaining valid results for that subject. If you applied the same standards of truth to everything, you would not be able to function in society. Do you demand such standards from your loved ones before you accept what they say. You should since the same principle applies. Anyway, this comment was in part done to clarify my viewpoint more so than go overboard over a flippant comment. Its more just to make people think and ponder about their unexamined assumptions of scientific authority just because its given credibility by authority. It is so true, being INTP in public school especially is hard. I usually have a sour relationship with most of my teachers due to my ‘attitude’. They criticize my way of doing things most of the time. But I’m doing ok in uni cause they let you rein your own thought and expand it. Hello! I’m an INFP studying to be a Secondary Education English teacher. As an Intuitive-Feeling Personality Type, I know I’ll rub some of my students the wrong way if I don’t recognize what they need, and your article is so helpful to know how to cater to the other Personality Types who will inevitably be in my classroom. I appreciate this article so much that I’m printing it out for reference! Thanks for this great article. FYI – there is a validated and widely-used assessment that measures psychological type in children ages 7 through 18: the MMTIC Personality Type Indicator for Children. Could be a good resource for your readers! This is so true for me. As an ENFJ, I found grade school tedious and I would often forget details of homework or skip important details on tests because I was more focused on the big picture and hated “checking over” things. High school classes were a lot more fun – especially Literature, History, Philosophy, and Language electives. I found out I was actually one of the “smart” ones. In hind site, the classes I struggles in usually had SJ teachers who required repetition and (in my eyes) mundane details. I wish more teachers had the opportunity to learn how MBTI could help in the classroom. I totally agree with this article. I am an INTP in high school, and it’s terrible. Most of my teachers are sensors and I am really looking forward to college or university when I will be able to learn some higher-level stuff and going deeper into the topic without the teacher criticizing me for asking questions.